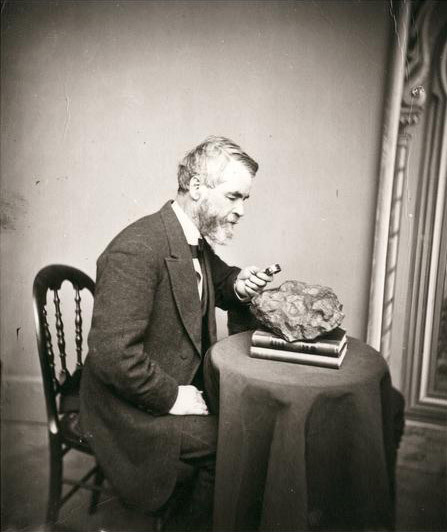 Increase Lapham Examining a Meteorite, 1871 ca. A self-educated engineer and naturalist, Increase Lapham was Wisconsin's first scientist and one of its foremost citizens. He wrote the first book published in Wisconsin, made the first accurate maps of the state, investigated Wisconsin's effigy mounds, native trees and grasses, climatic patterns and geology, and helped found many of the schools, colleges and other cultural institutions that still enrich the state today. Increase Allen Lapham was born in Palmyra, New York, on March 7, 1811. The fifth of 13 children, his Quaker parents could not afford to have their children attend school so Lapham, the son of a canal contractor, became a laborer on canal construction crews. He got his first job at age 13, cutting stone for lock gates at Lockport, New York. Even without formal education, Lapham demonstrated an early talent for topographical sketching. When he was 14 Lapham began supplementing his dollar-a-day income by drawing and selling plans of the lock to townspeople. He became so proficient that in 1828, when only 17, he drafted virtually all of the plans for the canal at Shippingsport, Kentucky. On the strength of his drafting skills, Lapham rose from a common laborer to an engineer and surveyor of canals in the 1830s. He surveyed part of the Ohio Canal, and in 1835 he was appointed deputy surveyor of Franklin County, Ohio. Early in 1836 Lapham received an invitation from his former employer, Byron Kilbourn, to come to Milwaukee. Ten years before, Lapham had worked under Kilbourn on the engineering crew of the Miami Canal. Kilbourn had recently begun speculating in Wisconsin and believed that the construction of the Milwaukee and Rock River Canal would allow Milwaukee to become the pre-eminent lakeshore city. Lapham accepted Kilbourn's offer to become chief engineer and arrived in Milwaukee on July 1, 1836. The canal was never built, but Lapham decided to stay in Wisconsin anyway, settling with his new wife, Ann Maria Alcott, in Milwaukee in 1838. Over the next 20 years, Lapham helped his new hometown grow from a village to a booming city. Appointed deputy surveyor for Wisconsin Territory, Lapham surveyed city plots and registering land claims until the government land office opened in Milwaukee. He arbitrated land claims and drew the basic plat of the city. Lapham was also instrumental in the establishment of the Milwaukee public high school program and was one of the founders of the Milwaukee Female Seminary. Lapham continued his scientific work as well. In 1836 he published Wisconsin's first scientific imprint, a Catalogue of Plants and Shells Found in the vicinity of Milwaukee. His Geographical and Topographical Description of Wisconsin, published in 1844, proved tremendously popular with immigrants looking for information about their new home. He also drew the first map published in the area. Among his approximately 80 books, articles and pamphlets, the two most important were "The Antiquities of Wisconsin" (1855), which focused attention on the state's Indian mounds, and Report on the Disastrous Effects of the Destruction of Forest Trees, Now Going on So Rapidly in the State of Wisconsin (1867), a pioneering work in the field of forest conservation. Lapham's report on forest trees had included a plea for a more widespread system of weather observations. His close study of weather conditions had convinced him that weather could be predicted if the meteorological data were reported and mapped. With Lapham's help, the National Weather Bureau, the forerunner of today's National Weather Service, was established in 1870. Lapham was a founder and member of many early educational, civic and scientific organizations in Wisconsin, and he corresponded regularly with leading scientists throughout the world. 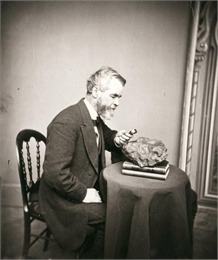 After his death from a heart attack in September 1875, his natural history collection, including fossils, minerals, shells, meteorites, Indian relics and a large herbarium, was acquired by the Legislature for the University of Wisconsin.